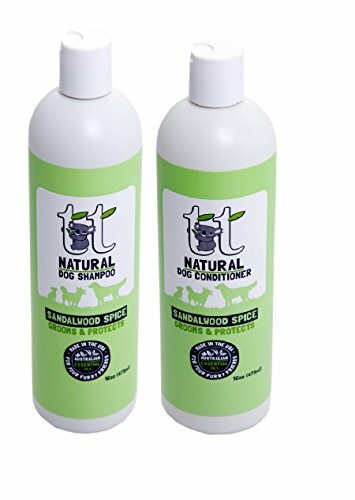 SHAMPOO: A soft coat, a delicious fresh and woody scent and natural protection from scrapes, itching and bugs - what more could your furry friend possibly want? Our signature natural grooming essential oils blend of Eucalyptus/Tea Tree/Lemon Myrtle/Sandalwood is combined with Rosemary Oil & Lavender Oil to cleanse the coat and protect your pet. Our formula is gentle, natural & extremely effective. Paraben-free, dye-free and 100% biodegradable. Packaged in 100% recycled plastic. Suitable for humans, dogs & horses. CONDITIONER: Lavish your fuzzy buddy with healthful, nourishing conditioners, gentle detanglers and a rich, woodsy scent. We combine Sandalwood/Eucalyptus/Tea Tree/Lemon Myrtle with Rosemary Oil & Lavender Oil to condition the coat and protect your pet from scrapes, itching and bugs. Vitamin E and d-Panthenol work to detangle, moisturize and reduce static in your pet's coat. Smells delectable! SLS-free, paraben-free, dye-free and biodegradable. Packaged in 100% recycled plastic. Soft fur, a delicious scent and protection for their coat. Nourish your friend with our unique patented blend of Australian essential oils which include: tea tree, eucalyptus, lemon myrtle, and sandalwood spice. These sustainably sourced Australian essential oils have proven cleansing and conditioning properties and they smell great. Grooms and protects. Simply wet your pet, lather up with the rich goodness of tt Sandalwood Spice Shampoo and finish with tt Sandalwood Spice Conditioner. Gentle, natural and effective. Suitable for dogs, cats, rabbits, horses, and humans. If you have any questions about this product by tt for dogs, contact us by completing and submitting the form below. If you are looking for a specif part number, please include it with your message.